Do you know what tastes heavenly after a long day of selling sweets on one’s feet? A steaming bowl of porky ramen. The noodling tradition began this past summer when the Eat My Blog committee stopped by the Yatai Ramen pop-up at BreadBar to fuel up after the event. As we buried our heads into the rich and savory bowls, satisfying our bodies’ every craving with each slurp, we vowed to make this a permanent ritual. 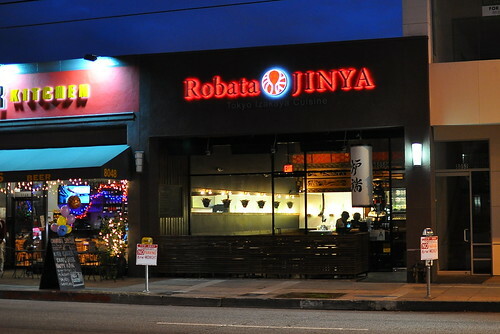 We kept our promise to ourselves and stopped into Robata Jinya for a bite after the most recent bake sale. 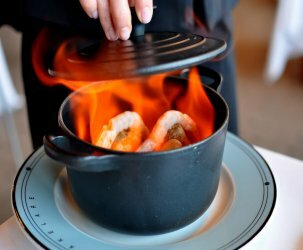 According to the restaurant’s website, Robata Jinya first opened its doors 40 years ago in Japan. This Third Street outlet comes from the same owner who oversees seven restaurants in Japan and one in Hong Kong. 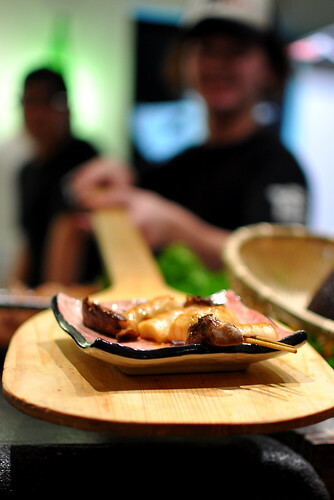 Without reservations, our party of five was seated along the robata bar toward the back of the restaurant. 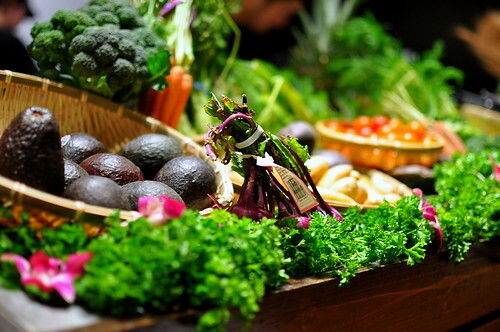 The bar was overflowing with a gorgeous collection of produce, most of which would meet its fate upon the charcoal grill by the end of the night. 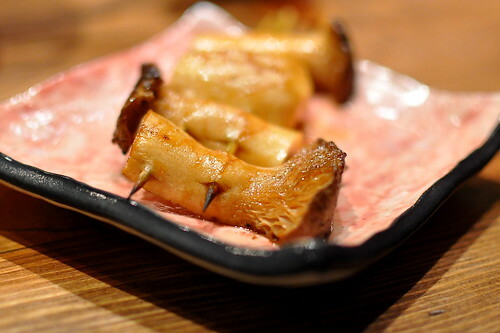 To get the robata and ramen party started, I ordered some eryngii mushrooms ($2.40). The plate was delivered on a long wooden plank—one of the exciting perks of dining bar-side. The meaty mushrooms were juicy, a bit smoky, and incredibly flavorful. Served alongside the mushrooms were three distinct sauces—garlic soy, cilantro yuzu, and spicy aioli. I was most enamored by the straightforward garlic and soy sauce preparation, but truth be told, the expertly grilled mushrooms required very little adornment. To satisfy the ramen part of my meal, I ordered the Kyoto Spicy Ramen ($8.50). While the not-so-spicy pork-based broth was wonderfully rich and well seasoned, the supporting cast wasn’t as memorable. The fatty slices of pork (chashu) didn’t melt in my mouth, and I was yearning for some wobbly yolk action in the form of a hard boiled egg. Even though this bowl lacked the usual touches that I desire in a bowl of ramen, the strength of the broth alone was enough to satisfy my craving. The Astronomer was fortunate enough to score a bowl of the Hakata Tonkotsu Ramen ($9.50), of which the restaurant produces only 20 servings per day. His bowl was garnished similarly to mine with a few spinach leaves and fried onions. 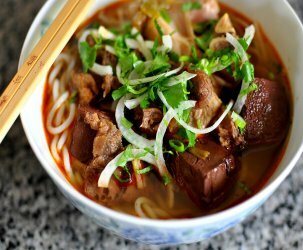 The milky broth was lethal for our arteries, but oh so delightful for our taste buds. 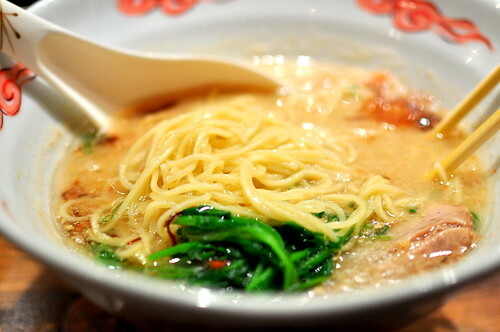 Straight and bouncy noodles were employed in all of Jinya’s ramens; the long strands melded swimmingly with the broths. While the Eat My Blog committee isn’t sure where the next sale will be held, we are one-hundred percent certain that the day will end with warm bowls of soul soothing ramen. Some things are just guaranteed. Nice work Cathy! Ramen sounds good right about now! 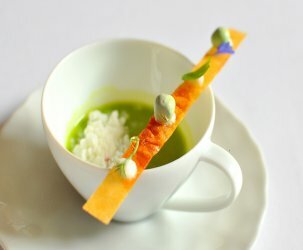 Mmmm, that broth looks so rich. Though IMO a bowl of ramen without a boiled egg is like a christmas tree without ornaments. I [heart] Ramen, and I definitely [heart] this post. I wish we had places like this around here.no ramen for me. oh man what i would do for a bowl of this right now!!! it was the best way to wrap up emb. we must do this again, pretty please??? When I ate at Burger Kitchen, Robata Jinya wasn’t open yet. Boo! Congrats on another successful Eat My Blog event! You guys Rock! 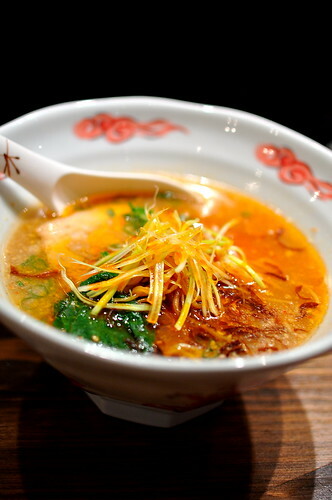 A Bowl of Warm ramen would be so good right now…breakfast, lunch or dinner I’ll take it in this cold wet So Cal weather. I haven’t had ramen since bread bar either! Been eating slurping olive oil instead. Thanks for the reminder and high five to the Astro man for scoring that bowl. Thanks, Kirbie! I shoot with a Nikon D90 with a 35mm f1.8 lens. It performs like a champion in low-light situations. 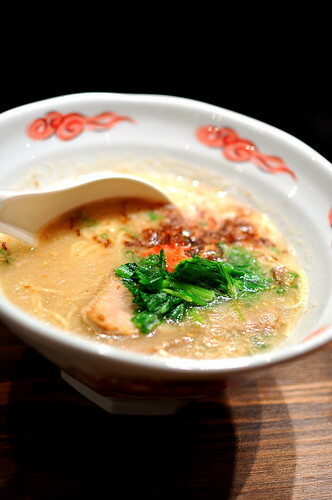 Hakata tonkatsu ramen, you must be mine! I can’t believe they only make 20 a day! Do you know why? Misty – It’s because the broth takes ages to prepare.